All right, I’m back. I was out sick last week but I’m feeling much better now and ready to blog. While winter may has probably effectively shut down all off your grilling activities for the next several months, here in New Mexico we still get some decent barbeque weather. Sunday we had a break in the ominous Snow-pocolypse that was fast approaching Albuquerque. If we get more than an inch of snow it will effective shut down the entire state, you laugh but it’s true. Anyway, I seized my window of opportunity to cook up a dish I’ve been working on this year, Beef Short Ribs. 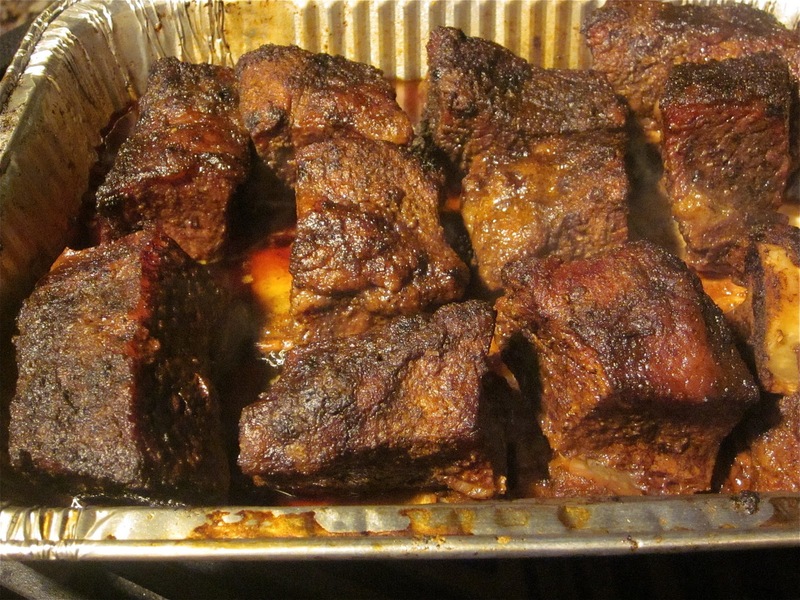 This was the 3rd time I’ve cooked short ribs and it was the charm. They were the most fantastic hunks of beef I’ve cooked all year. 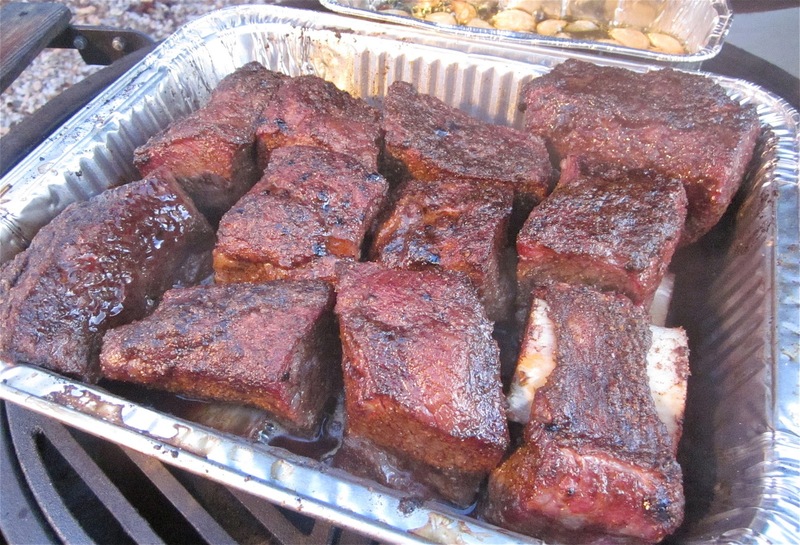 The giant meaty morsels had all the flavor of a roast with the richness of a prime rib. It was damn good! 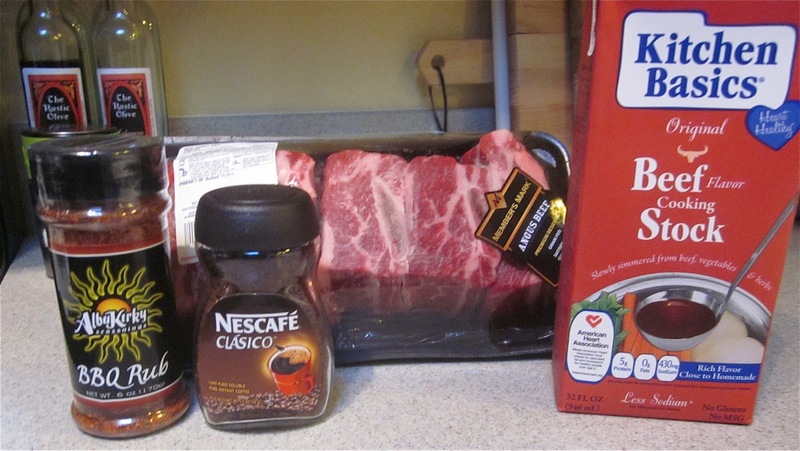 I started with 2 packs of beef short ribs, AlbuKirky BBQ Rub, instant coffee and beef stock. For the seasoning I mixed 1 part coffee to 3 parts BBQ Rub. I used instant coffee because I wanted the coffee flavor to melt into the meat and didn’t want any chewy grounds on the ribs. If you don’t have instant coffee you can substitute fine ground regular coffee. Using some olive oil, I coated the ribs and rubbed the seasoning into the meat. Then placed the ribs bone side down in a foil pan and added enough beef broth to cover the bones of the ribs, about ¼ up the side of the pan. When cooking beef, it just cries out for smoke. So I fired up the Big Green Egg and set it up for indirect cooking using the plate setter. For charcoal I used only my trusty Royal Oak Lump. I just wanted a mild smoke so I decided to forgo any additional wood chunks. I then placed the pan in the egg uncovered and cooked for 1 ½ hours at 300-350F. During the cook I added some beef broth to pan to keep the drippings from burning in the pan. 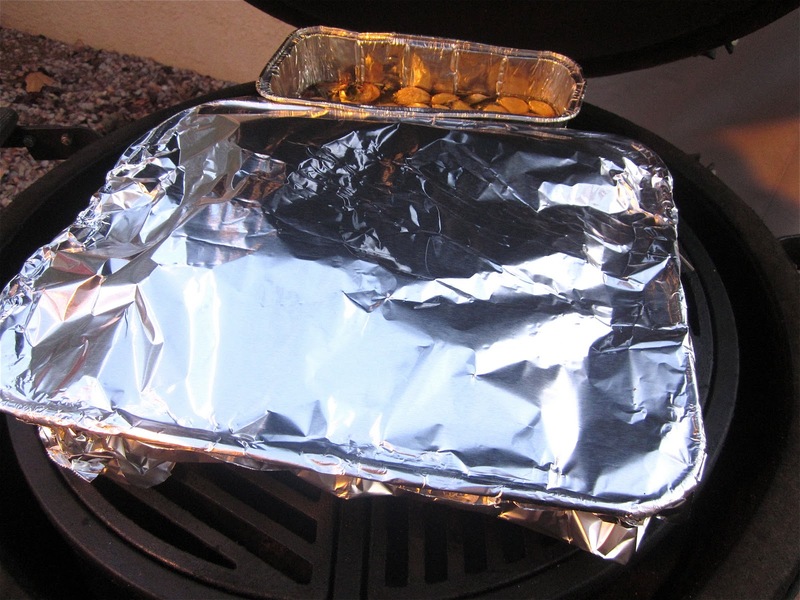 After 1 ½ hours I added more broth and covered with foil and cooked for another hour. This is where the magic happened. The steam from the broth tenderized the ribs and turned them a rich and decadent beef nugget that you will never forget. Once the ribs had steamed for an hour I removed the foil and cooked for another 30-45 minutes, just enough time to bark up the outside coating. Short Ribs are almost ready. The moment of truth that first bite. I could tell when stuck my fork into the beefy nugget I could tell it was tender. The knife just sliced right through the meat like melted butter. In that first bite I could taste the spice from the rub, the rich coffee flavor and just a kiss of smoke then rich beef flavor. It was absolutely decadent. So for those of you who have retired your grill for the season or are already buried in 2 feet of snow, you can live vicariously through me and my blog. I will continue to fire up my grills and smoker every chance I get throughout the winter months. Maybe I’ll even convince some of you to move to NM. I came “this” close to buying a pack of these on Monday but picked up two flank steaks instead. I like your coffee rub combo. Short ribs on the BGE are great. The coffee adds a rich flavor to the rub the goes well with beef. I'll be looking for your short rib post. 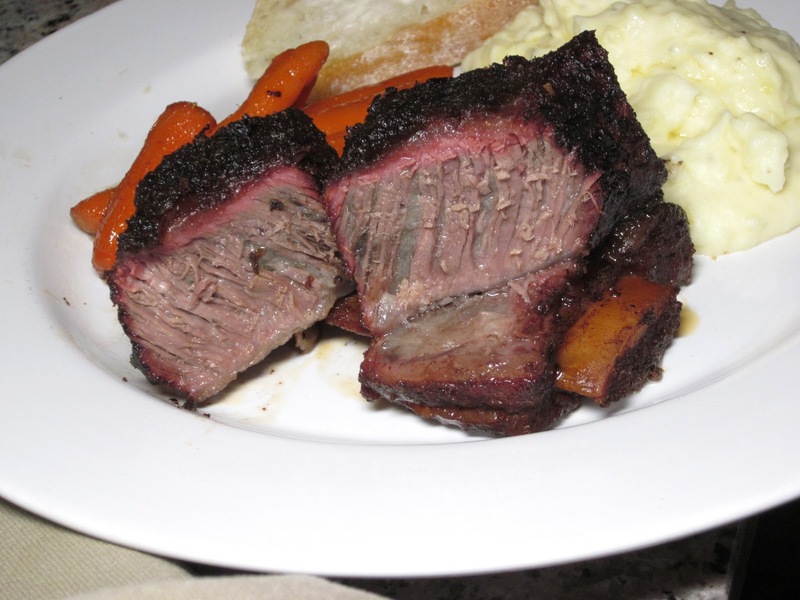 I have been scrounging for ideas for beef short ribs and remembered you had this great method. I so agree with your basic plan..long slow steaming/cooking. All that sinewy stuff turns to tender melting food! 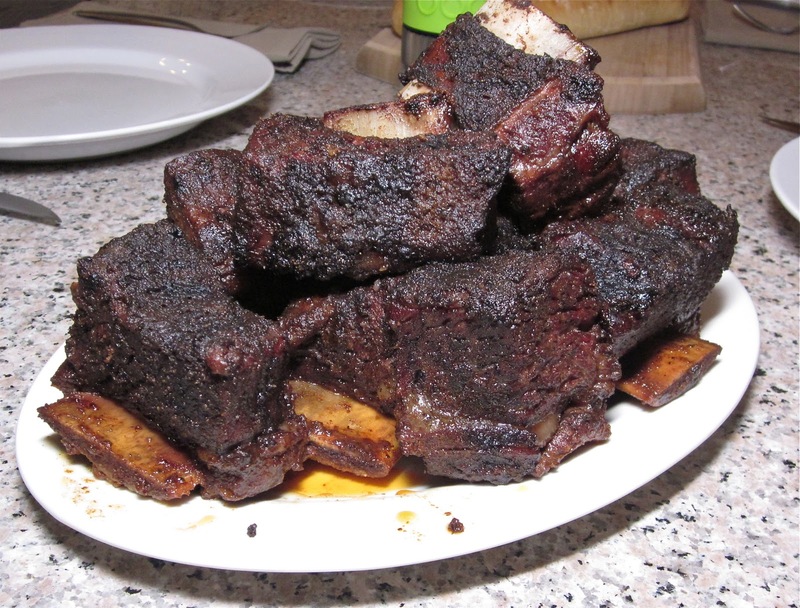 This is not a traditional african dish for my blog, but I have cooked short ribs for years on the bbq and often battled to get them tender enough. I have NEVER used coffee. What a great idea! I look forward to trying it soon. Is coffee often used in grilling/bbq that side of the world? Thanks for the comment Archi! Using coffee is not a real common ingredient but I have seen it used quit a bit. I have found that instant coffee works better, you get all the flavor without the grounds. I struggled with the short rib the first couple of time I made them. The braising in some liquid and cooking them long enough is all it takes for tender and delicious short ribs. I did these today. They were hands down the greatest! Thank you for the recipe and the details. I did a lower heat and longer times but they were mouthwatering beef nuggets of greatness.